Beans are a staple food in any plant based diet. They are full of protein and fiber and essential vitamins and minerals. They can be a part of, or the center of almost every meal; added to tacos and burritos, bulking up your salads, turned into dips and sauces, or just eaten on a bed of fluffy brown rice with a few dashes of hot sauce. Although they are easily available and inexpensively purchased pre-cooked and canned, there is something about making your own beans from dry that just cannot be matched by those convenience products. The flavor and texture of a perfectly home cooked bean is unmatched by anything you can find in a can or pouch. Not to mention all of the money you’ll save, and all of the waste you’ll eliminate, by cooking your favorite beans from scratch. The tough exterior of dry beans often scares people away from cooking them at home. The thought of transforming those little pebbles you find in the grocery store bulk bins into a creamy, flavorful dish seems daunting or downright impossible. But don’t be afraid. With just two easy steps, “quick soaking” and pressure cooking, you are fewer than two carefree hours away from enjoying perfectly cooked bean at home. Yes, technically speaking, you can cook beans in the Instant Pot without soaking. However, you will find that the cooking times can be all over the place, and the final product is often inconsistent. Some beans will be overcooked and completely decimated, while others are still gritty or firm in the center. Soaking the beans not only helps them to cook more evenly, but it also helps make them more digestible. Traditional soaking methods can take anywhere from 8 to 24 hours, and that deters a lot of people from cooking them at home. Using the “quick soak” method gives the best of both worlds: you get the benefits of soaking, without hurdle of having to wait an unreasonable 8 hours. Although I say there are only two steps, you will find a very detailed description of those two steps below. To summarize, you need to soak the beans in hot water for an hour, and then cook them for 25 minutes in an electric pressure cooker. This technique has been tested with dry pinto beans, kidney beans, cannellini beans, black beans, and garbanzo beans. Legumes such as lentils and peas do not require soaking ahead of time, and have a different overall cooking time, so this method of cooking is not for them. I’ve also calibrated the time and measurements to cook 1 ½ to 2 cups of dry, unsoaked beans in an 6 quart Instant Pot brand electric multi-cooker. Cooking times may vary depending on the size of your Instant Pot, or the brand of your multi-cooker, and the amount of beans you are cooking in a given batch. So, without further ado, let’s get cooking! To start, bring a medium-sized pot of water to a boil. (Although there is a saute function on the Instant Pot that you could use to heat up the water, I find it’s just easier and a lot faster to bring water to a boil on the stovetop.) You want there to be enough water in the pot to fully cover the beans by at least double. So, if your dry beans fill up a quarter of your pot, make sure that you fill your pot at least three quarters of the way with water. As the water warms up, add a bit of salt, maybe a teaspoon for 6 cups of water. As Julia Child would encourage, taste your water. You want the taste to be pleasant, not too salty, but not bland. Use the time while your water heats up to rinse and drain your dry beans a few times. When your salted water comes to a boil, turn off the heat, and add your rinsed beans. Stir to make sure that no beans are stuck to each other. Put a lid on the pot and allow your beans to soak in the hot water for one hour. If you leave them for longer than an hour, it’s not a big deal. 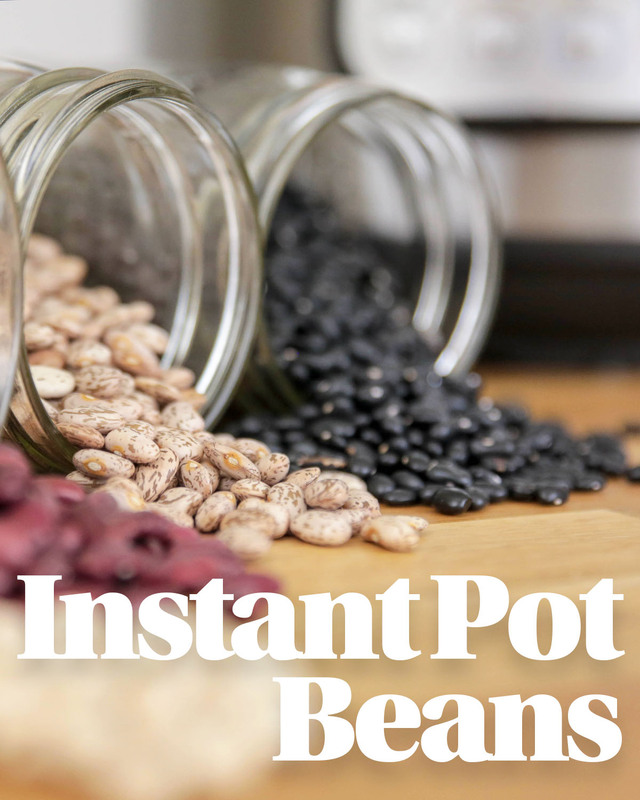 You may just find that your beans cook a bit faster in the Instant Pot. After an hour, drain your soaked beans into a colander, and rinse them thoroughly. I like to return the beans to the soaking pot, fill it with water, and then drain the beans again two or three times. Ideally, rinse them until you stop seeing a lot of bubbles forming around the beans. Add the soaked and drained beans to your Instant Pot or electric pressure cooker. Cover the beans with enough filtered water so that when you stick your index finger into the Instant Pot, the tip if your finger touches the top of the beans, and the water lever come up to the first bend in your finger. Seasoning is a personal choice, and entirely depends on your intended application. If you’re planning on making hummus, you may just want to salt the water, or add a bay leaf. If you are planning on making tacos or burritos, or eventually refried beans, then you might want to add a bit of cumin and coriander along with some chili powder and cayenne pepper. The options are truly endless. If I know I’m going to be eating the beans just as they are, maybe with a bit of olive oil and hot sauce, I’ll add a good amount of chopped onion, garlic, a tablespoon of Bragg’s Liquid Aminos, smoked paprika, and whatever seasonings I think sound good at the time. The goal of seasoning the water it to create a delicious broth for the beans to cook in. Regardless of how you season them, you want to taste the water before sealing the pot to make sure that the cooking liquid is delicious. If the liquid is bland, the beans will be bland. An important note on seasoning: Do not add anything acidic to the pot while the beans are initially cooking. Tomatoes, vinegars, and citrus will cause the skin of the beans to become tough and less permeable, causing the beans to take a lot longer to cook. If you plan on adding acidic ingredients to your meal, do that after the beans are fully cooked. Plug in your Instant Pot, making sure that your silicone seal is in place. Set the time for 25 minutes on high pressure, twist on the lid until it sings, and wait patiently. Although the time is set for 25 minutes, it will take probably about 10 minutes for the cooker to come up to pressure. When the time is up, use the quick release to relieve the pressure from your Instant Pot. If you are not able to release the right when the time is up, that’s fine, but know that the beans will continue to cook a bit more while still under pressure. Using a slotted spoon, test five beans for doneness. They should be creamy all the way through, but not soggy. If you sense a bit of grit when chewing the beans, they may need a few more minutes. The only thing worse than overcooked beans in undercooked beans. If they aren’t pleasant to eat because they are a bit too al dente, then put the lid back on, and set the timer for another 5 minutes. Quick release again, and test another 5 beans. The 25 minutes works perfectly for pinto, black, and kidney beans. I’ve found that chickpeas or garbanzo beans need at least 30 minutes under pressure, and could take up to 35 minutes to reach peak creaminess. Cannellini beans as well tend to take a few extra minutes, so you may want set your initial cook time for 27 or 28 minutes. To store your beans, remove the cooked beans with a slotted spoon to a jar or lidded container, and then cover the beans with the leftover cooking liquid. Beans will last in your refrigerator for 4 or 5 days, but can be frozen in a freezer jar for up to a few months.